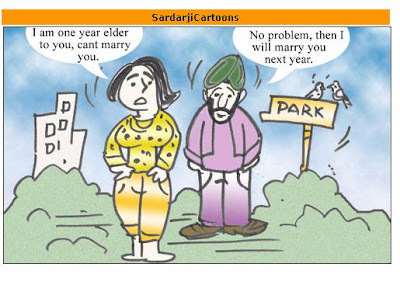 1.Sardar : What is the name of your car? 2. Sardar built 2 Swimming Pools. And he left one of them unfilled y? "Oye, that’s for those who don’t know Swimming. 3. A sardar saw a beautiful girl. He went and kissed her. Sardar: ” B.Com Final Year…. 4. Ek sardar Indian Flag lene shop mein gaya tha. Shopwale ne usse flag diya. Sardar bola: Isme aur colour dikhao!!! 5. Judge: Don't U have shame? It is d 3rd time U R coming to court. 6. A lady calls Santa for repairing door bell. Santa does not turns up for 4 days. Lady calls again, Santa replies: I am coming daily from 4 days, I press the bell, but no one comes out. 7.The teacher asks the Sardar: You have 10 chocolates, you give 5 to Anjali, 3 to Manju, and 2 to Smitha. What do you have now? 8. Santa khali kadahi me chammach chala raha tha to Banta ne poocha kya bana rahe ho ? Santa- BEWAKOOF bana raha hoon..
9. A man told santa: Banta is kissing your wife Santa hurriedly rushed to home, within half hour came back angrily and slapped the man and said: He is not Banta. 10. One tourist from U.S.A. asked to Sardar: Any great man born in this village?? ?